1. Kind of took an unintentional blog break over the past week, but rest assured – you missed nothing. My children were SPOILED rotten on Christmas – lots of dinosaurs for Pumpkin and much artsy-fartsy stuff for The Princess. They were both over-the-moon thrilled with everything they received. 2. In the tradition of KICKING CANCER’S BOOTY, if you haven’t already you may want to consider joining the National Marrow Donor Registry. 4. My daughters have been bickering like crazy – two weeks home is enough to make us all stir crazy. Our fuses have apparently shortened as well. 5. I took the girls to see the Alvin and the Chipmunks movie yesterday. That was moderately painful. This year there were some pretty smart “kids'” movies – UP, for example – so these goofy ones are frustrating. My daughters loved it, though. 6. The other day in a fit of boredom, I watched “Fool’s Gold” on cable (speaking of dumb movies). The movie starred Matthew McConaughey and Kate Hudson – so while I wasn’t expecting Oscar caliber work, I did expect that at the very least, I could be distracted enough by eye candy that the movie’s crappiness wouldn’t be obvious. Um, no. Even Matthew Mc’s chiseled physique could not save that wretched movie. So so sad. 7. Over the past few weeks, I finally went to Chipotle the first (and second) times. I may be thinking of Chipotle RIGHT THIS VERY MINUTE. I’m in love with their pork carnitas tacos, which reminds me a lot of the Real Simple slow cooker pulled pork tacos I made a few weeks ago and will probably make again soon – like next week-ish. They are amazing on corn tortillas covered with cilantro and there were lots of leftovers which meant that I ate them every day for four days but DID. NOT. CARE. Also, yum. 8. I immediately spent my Barnes & Noble gift cards from Christmas (my to-read pile is about 17 high at the moment), but my iTunes card is somehow still sitting on my desk. How on earth did that happen? Favorite music/apps/tv shows I should download? 9. Today may be the first day in over a week that Pumpkin has napped. I’m pleasantly surprised. VERY pleasantly surprised. 10. I met a lot of awesome people in 2009 and am grateful for the friends I have gotten to know better in the past year. I’m glad to know y’all, and I wish everyone a HAPPY NEW YEAR. 2010 is going to bring great things. 1. First things first: Merry Christmas eve! I hope that you have the day off work, and if you don’t, I hope your boss decides to let you leave early so you can get started on the celebrating and doing fun holidayish stuff. I hope everyone has a joyous day today and tomorrow – even if you don’t celebrate Christmas. 2. Today is my BAKING EXTRAVAGANZA. I’ll be baking two desserts for after tomorrow’s Christmas dinner, as well as the traditional MONKEY BREAD that I make every year. We’ll put it in the oven to warm while we open the presents in the morning, and then I’ll pour the icing on and we’ll basically demolish the whole thing in five minutes flat once the presents are all opened. It’s tradition, y’all. I use Martha Stewart’s monkey bread recipe. I know you can make it with store-bought dough, but I don’t do it that way. As a shortcut, I do make the dough in the breadmaker. I will cry if my breadmaker ever dies. It’s my favorite kitchen gadget. 3. I have a cold. Go figure. I started the day with a trip to the store for a little Christmas cheer in the form of DayQuil and Zicam. The Zicam has left the funkiest aftertaste ever. I think I need to wash my mouth out with some hot cocoa to kill the taste. 4. The DayQuil is making me foggy. It’s not supposed to do that, is it? That’s why it’s DAY quil. Sigh. This doesn’t bode well for my day (or this post). 5. Rolling Stone magazine announced its Top Tens of the decade – including the Top Ten movies of the decade. I’ve only seen two. And one was The Incredibles. 6. So, I’m kind of addicted to the Words With Friends app for the iPhone. I’ve now hit their limit on number of active games you can have going on at a single time. Kind of makes me sad. Also, I lose as many games as I win, and somehow I scored over 100 points with the word JUTE yesterday, and that made me giddy because I’d never even heard of the word jute until I saw it in Patrick Swayze’s book… yesterday. Fate, I tell you. 7. Okay, Patrick Swayze’s book. The Time of My Life was written by Patrick and his wife, Lisa Niemi and was published either shortly before or after he passed away from pancreatic cancer. I’d always liked him in movies – “Dirty Dancing” is still one of those movies that I love watching, and “Point Break” is on tv all the time for some reason. I dig him as an actor, but as I read this book I thought, Wow, he was really kind of full of himself. I don’t deny that it takes some serious strength to keep up the intense work schedule he did while fighting cancer – but holy moly, I liked Patrick Swayze a LOT better before this book. (This unofficial review is brought to you by the public library and nothing better to read). 8. Are there any presents you are just SO EXCITED you can’t wait to give? There’s one like that under our tree. I think I picked the perfect thing and I’m so giddy about it. Is it time to open presents yet? 9. So, apparently, I’ve forgotten how to read music. I went to look at the chord exercises from last week’s guitar lesson and I’ve completely blanked on how to read the notes and the rhythm. And that was BEFORE the cold medicine. 10. Santa’s journey has begun. Today, we’ll be tracking Santa via Norad, baking all this stuff, trying to get everything done, and just trying to stay warm (I hope Santa’s sleigh has heated seats!). If you are following my 101 List Project at all, you’ll know that I put myself on a mission: to read 250 books in 1,001 days. Many people scoffed at that goal – but, lemme tell you – I’m currently reading my 107th book of 2009. 107. Yeah. That’s kind of a lot of books. When the year is completely kaput, I’ll do a recap of my favorite books of 2009. 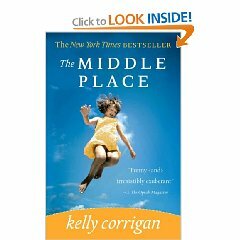 The book I’m reading at the moment is definitely in my top 5 for 2009 –The Middle Place by Kelly Corrigan. This book is currently selling for less than $5 on Amazon, and it’s definitely been an emotional, yet funny read – all rolled into one. I’m SO close to the end, but it’s been a hard book to put down because I’m really enjoying Kelly’s voice as she tells her story. It’s a memoir written by Kelly Corrigan that weaves between her childhood and her diagnosis and fight against breast cancer. To follow Kelly’s journey, not only from her diagnosis and treatment, but through having to grow up. The below video is Kelly Corrigan reading her essay “Transcending”. Not a sponsored or paid review. As a parent, there are some days where at the end of the day I am two steps away from curling up in the fetal position and sucking my thumb. For the most part, my days have an ebb and flow to them – maybe some not so fabulous moments tempered by some awesome moments so by day end, I’m exhausted, sure – but ready to get some rest and start all over again the next day. And there are days like today. Days that start smoothly – and then… keep flowing smoothly. It was the last day of school before Winter Break – this is a day I both love and dread. Love, because we LOVE Christmas and I’ve actually made some plans to keep the kiddarooni’s occupied during their time off. Dread because, well… two weeks off from school? No down time. Kids bickering. Yeah. Today was The Princess’s school Christmas party – they did something a little different this year. It was a “Christmas Morning” party – so the kids would arrive to school in their jammies, eat breakfast, and the parents had sent a small gift for under the tree so each of the kids got to open a present. Fabulous. However, today is Friday. Our Friday morning ritual is to go out for donuts. This morning, the girls and I were out the door by quarter after seven. We zipped by Panera (toasted everything bagel, por favor). We zipped through the Krispy Kreme drive thru (AND THE HOT LIGHT WAS ON! Free donuts!). Starbucks drive thru next (because mommy isn’t facing a room full of second graders without being thoroughly caffeinated) and on to school. We got there early so while Pumpkin and The Princess got situated doing Christmassy crafty things, they put me to work making pancakes. They had a TON of food for the kids (always too much! ), and the kids ate breakfast and then socialized. It was fun to see The Princess take my camera and pose her friends and set up her shots. Her pictures MAY have turned out better than mine today. After the party, Pumpkin and I returned home in time for a lunch that neither of us were hungry for, and I settled her in for a nap and I got some work done. And she napped and I worked. And she woke up from her nap and we had a mellow afternoon. And for the most part, it’s been this day of one right thing after another right up to tucking the girls in together in Pumpkin’s room because they are having a sleepover. Maybe tomorrow they’ll wake up annoyed with each other. That’s entirely possible. But today was one of the good days. 1. Usually, I sit on the floor cross-legged while I’m working (I believe the new politically correct term for this is “criss-cross-applesauce which is absolutely moronic, but oh well – that’s what they are teaching the kids these days so, applesauce it is). I just went to stand up and sit and completely lost feeling in my left foot. I appreciate that no one was around to see that because I can’t even pretend I was even a tiny bit graceful trying to regain feeling in my foot. 2. Pumpkin wants dumplings. She’s been talking about dumplings (aka steamed potstickers) for awhile now, so that’s dinner. I’ll get some Chinese takeout and we’ll have to get like a triple order of dumplings because that’s our favorite. I was kind of lukewarm on the idea – but every time I type the word “potsticker” or “dumpling” I get just a little hungrier. 3. Tomorrow is the last day of school before a two week winter break. TWO. WEEKS. Trying to fill that time should be interesting because it’s pretty darn cold right now and I try to avoid being outside if I can help it. Yet, for some reason I want to take the girls ice skating. 4. I’ll be doing the Avon Walk again. If you’d like to support me, click here. The money goes for breast cancer research and services. You can visit Avon’s website to see how the donated money is spent. I’m so thrilled to be participating again – it’s a fabulous cause. 5. Has anyone seen “The Princess and the Frog”? What did you think? Worth taking the kids to see? I wish there were more kids’ movies out right now – would make that whole killing time during the holidays thing a little easier. 6. Guitar lesson today was pretty low key – which I would expect – in holiday winddown mode and all. We worked a little itty bitty bit on the Damien Rice song we started a few weeks ago, and then moved into some chord progression exercises which are an effort to make me hate the F chord a little less, I think. Sometimes I think the chord exercises are fun – and sound quite a bit cooler than what they actually are. 7. I got hit with a short-lived bug yesterday — felt a headache brewing and then all of the sudden, I was camped on my couch with saltines and 7UP. I managed to snooze a little bit after eating a few ibuprofen and seemed to take care of the headache – eventually I was back to my usual self. I have no idea if it was a shortlived bug – or just a migraine – and if it was a migraine? UGH. I’d like to not have those anymore, please. 8. Are you done Christmas shopping? I am! I am! Well. Almost. I need to shop for my Stepson. In the past week, we’ve gotten a few calls asking what to get him – and we’ve asked him, he doesn’t know what he wants. “If you don’t tell people what you want, they’re gonna get you clothes,” we told him. Still, he can’t think of anything either. Fourteen year olds are hard to shop for. 9. It’s taken me over an hour to type that. My attention span today? EH, not so much. 10. This afternoon, I’ve been exchanging songs with friends that remind me of my youth (i.e. from about fifth grade through high school) – when you think back on that time – what songs do you remember? So… I was gonna host a cookie party. The girls were really antsy by Saturday morning. “How many minutes until the cookie party?” Pumpkin would ask. I would break the hours down into minutes (OH, the HUNDREDS of minutes) and she’d groan. Well, yeah. Two o clock seemed awfully far away. Finally, as the hour grew closer, I covered the table with garbage bags (cheaper than tablecloths and spilled drinks don’t soak through it. I may be crazy to host this cookie party – but not crazy enough to gunk up the finish on my table). The girls would decorate cookies and then I’d set them aside on my counter – each girl (and there were five in addition to my two peeps) had a space assigned to her for her cookie creations. After awhile, they grew tired of the process and ran upstairs to play (after a cookie or two was consumed!). Downstairs, me and Hubby and my sister worked on decorating the remaining cookies and packing up the cookies for when the girls’ parents arrived to take them home. Each girl decorated at least a dozen cookies (some did more than that), and they left with their hands full of Christmassy creations. I, on the other hand, was left with a lot of sprinkles to vacuum. (I love my Dyson!). It’s a crazy, messy, time consuming thing – and yet… we love it. When I tucked the girls in at the end of the day, both were still jubilant over the fun they’d had. To me, that’s worth the work (and the scab I have on my right hand from burning my hand on the oven rack! Ouch!). It is definitely a sign to us that Christmas is near. I hope they don’t outgrow it for a long time. In the car. I have come to the conclusion that in Michigan driver’s licenses come inside specially-marked boxes of cereal, and most people only have to dig to the bottom of the bag of corn flakes to get one because there is no other way to explain the fact that the majority of the people on the road (or so it seems – see above about that whole PMS thing) have only a cursory understanding of the basic traffic laws – the rules of the road. My biggest pet peeve is that most people bought cars that didn’t come with turn signals. I didn’t realize they MADE cars without turn signals, but clearly they did otherwise people would be using them. It doesn’t take but a second (possibly less – I haven’t officially tested it) to flick that blinker to indicate your turn, so surely, it must be that they don’t have them. So everyone – check before you buy your next car: Does it have a turn signal? Does it work? Awesome. You’re all set. We’re in the “readjustment to winter” phase in Michigan. Just got slammed with the first snow of the season and cars are either going to slow or too fast. Me? I don’t mind a little caution right about now. And if your caution is directly related to the number of cars you see in the ditch (as mine is), that’s okay by me. I left my house early, I built time into my drive for this. Which is why when people tailgate on slippery roads (I’m talking to you Mr. Pewter Chevy Blazer Guy with the Cell Phone Plastered To Your Right Ear), I get a little angry. See all those cars in a ditch? It’s because the roads are slick. So – if I have to stop for any reason? You’re probably gonna rear end me. Sure, accidents happen. Snow increases the odds of that – but hang up your phone, drop the speed a few miles per hour and then just start praying I turn soon if you absolutely can’t stand driving behind me. This time of year, I wish I could just magically teleport myself to my end destination rather than be on the road – but since I have to travel, I’d like to travel safe. And if I am travelling safe, I’d like the people around me to be cautious as well. Take your time and be safe, y’all. 1. It’s winter in west Michigan. Bleh. We’re on Snow Day, Day Two, and I’m not super enthused about the whole weather situation outside. Yesterday’s snow day was ridiculous – the roads were a little wet in the morning, but there had been no snow accumulation. It was as though the meteorologists hyped this “blizzard” we were getting so they felt the need to call things off yesterday. Silly. TODAY, on the other hand, well, I’m in COMPLETE AGREEMENT with the decision to have a snow day. The roads are rotten, the visibility is less than fabulous (blowing snow FTL), and it’s really freaking cold. 2. I’ve actually done alright balancing work with having The Princess home, though. I’ve gotten a lot done and even took a break from work to sweep and scrub all my floors. The house smells like Easter eggs (I use white vinegar for my floors), but it’s nice to have shiny floors. 3. This weekend is our annual cookie decorating party which means tomorrow? There will be MUCH cookie baking going on. I make two kinds of cookies – sugar and gingerbread. The gingerbread ones are my favorite. That’s why I use a Cooking Light recipe for them – because I eat a LOT of them in the whole process. I may or may not break some on purpose so I can eat the scraps. 4. I got a huge bunch of present wrapping done last night. The downside? I realized I had more gifts for Pumpkin than The Princess. This wasn’t intentional – in fact, originally it was the other way around and I think I stocked up on dinosaur gifts to “even” things out – and then tipped too far in the opposite direction. Now, I need one or two more small things to even things out. And I’m not sure what I want to get. 5. I’m also clueless as to what to buy my mom’s husband. And my brother. I’m so so so close to being done with my Christmas shopping – I’m hoping to wrap it up this weekend. was sad (to put it mildly). Anyone else planning to see this? 7. I think I need a cookie. Too bad I haven’t started baking them yet. 8. I’ve only half been watching “So You Think You Can Dance” this season, but I have to say I was pretty annoyed that the woman who hurt her shoulder managed to get enough call-in votes to go to the finals despite the other two having to be in the bottom two and “dance for their life” (egads – so dramatic). If I was a dancer who worked my heiney off all week in rehearsal and then dancing live, I would think I’d be mad that someone essentially got a freebie. OH, THE DRAMA. 9. Yesterday, Pumpkin refused to nap. At four, I count my blessings that she still naps at all but knew it’d be rocky trying to get her settled in when her big sis was home from school. Eventually, she asked me to put on the movie “Up” and then a little later, asked if she could cuddle with me. She fell asleep in my arms and stayed snug there for an hour (I turned off UP, and started watching the Top Chef marathon). It was nice – She’s such a cuddle bug. I made sure to snap several pictures of her snoozing – which is good because when she woke I said, “You fell asleep in mommy’s arms!” to which she replied, “NO I DIDN’T.” Contrary girl. 10. Green tea is not coffee. Not even close. Sure, it’s warm ant it even has some antioxidant stuff going for it, but… I wish I had coffee. (In the space of one post I am in need of cookies and coffee – must be time for an afternoon snack). I picked two pair of these pants for my birthday for workout pants and love them so much I asked my grandmother for another pair for Christmas. They are the Macy’s brand pants – so they’re not too pricey (under $20), and they are SO COMFORTABLE. And not only are they comfortable, they’re a loose enough fit so that they are amazingly flattering as well. They are not necessarily my favorite pants for RUNNING (I prefer shorts or a closer fit for running), but for walking, aerobic workouts and the like? These are awesome. Oh, they’re comfy for sleeping in also (which is good because OMG it’s COLD IN MICHIGAN). You know the cookies I’m talking about, right? The pink and white frosted ones with sprinkles? I started thinking of these the other day, and haven’t been able to stop. These are my favorite grocery store cookie. MMMMMM. Cookies. It’s kind of funny because I’m not a woman who always has her hair and make up done. In fact, I usually don’t. But man, I am a sucker for a Sephora e-blast telling me what’s on sale, or that there are free full sized samples – or look! Shiny! Pretty much if it’s beauty related, you can get it at Sephora and that means I never have to go into a department store and wait for some snippy little chick in a white coat at the Clinque counter to help me find the right color of foundation. Also – free samples! So there’s a few things I’m liking – I wish I got paid to say nice things about them (or got free cookies in return). Alas, it’s just the kindness of my own heart that makes me say how much I adore them. What are some things you’re liking these days? (And yes, a TIL Tuesday post means I may have a little bit of writer’s block). 2. My guitar teacher was very cranky today. VERY. And that stinks – because it wasn’t that she was being snippy, it was that her general mood wasn’t pleasant. We all have days like that, but it stinks when it’s one of those things I look forward to all week. 3. I started learning Damien Rice’s “Volcano” today – the guitar part is not really the focal part of the song, so it’s kind of a different thing for me. Also, F CHORD. BAH. 4. After I left my lesson with my cranky teacher, I stopped at the Starbucks drivethru for a little pick-me-up. They accidentally made me two cappuccinos. They only charged me for one and gave me both. It was definitely a fun surprise, and yes, I tipped accordingly. 5. I’m meeting some friends for dinner tonight – and I’m so looking forward to an awesome meal that everything else I’ve eaten today might as well be cardboard. I’m starving and nothing will be as good as whatever fabulous thing I order tonight. I think I may well eat my weight in spaghetti. 6. Pink eye has hit our house. Not me. Not the kids. Hubby. Weird. As soon as he told me it was pinkeye, my eye started itching. So, I guess it’s not just the word L-I-C-E that triggers that physical reaction. 7. Waitaminute. That piece of gingerbread I just had? That may be as good as pasta. Maybe. 8. I’ve gotten a good chunk of my Christmas shopping done. The only person who we still need to shop for is Stepson. Fourteen year old boys are difficult to shop for. At least, this particular one is. What a weird age. 9. Pumpkin has taken to the belief that VW Beetles are “tiny cars” used solely for the purpose of “decoration”. We saw a red one in the parking lot of the grocery store the other day. She said, “Awwwww. How cute! Is it just for decoration?” I’m not really sure where that came from but it makes me laugh every time. 10. It’s supposed to snow in the next few days. A few flakes came down while I was driving home from guitar. I know it’s well within the seasonal realm for there to be snow now, but I just don’t want it. Not one tiny bit. Nope. Someone else can have the snow. Maybe I should temporarily relocate til spring thaws everything out!